Scientists have confirmed that a frog found living in New York City wetlands is a new species. Jeremy Feinberg, of Rutgers University in New Jersey, who led the study, first reported the discovery when he heard their "very odd" chorusing call. Teaming up with genetics experts to confirm the finding, Mr Feinberg has now published the discovery in the journal Plos One. It is the first new frog species found in the region for nearly 30 years. Mr Feinberg told BBC News he knew he might be on to something when he heard a group of them calling in chorus at a wetland study site on Staten Island. "Frogs have very stereotyped calls within a species, so I knew this was different," the ecologist told BBC News. "But it took me two years to find someone to partner with me on the genetics side." He believes the frog, named Rana kauffeldi - a leopard frog - probably once inhabited Manhattan, so it had been seen before. 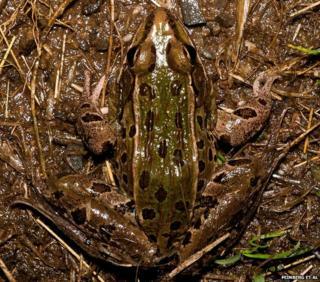 But it was assumed to belong to a similar-looking, previously known species of leopard frog (so named because of its spots) found in the same area. Mr Feinberg's familiarity with the known species meant that its call finally gave it away. When his colleagues tested samples of tissue taken from the frogs, they confirmed that he was right - this urban-dwelling amphibian was a genetically distinct species. It is a rare finding in North America: the continent's frog species are well documented. "This is only the third new species of frog to be discovered north of Mexico since 1986," said Mr Feinberg. "What also makes this crazy is that it's in a urban area - [that's] what makes it a double whammy." But he explained: "You wouldn't find it hopping around Times Square" - or even in the ponds in Central Park. "[These frogs] probably require wetland areas of something on the average minimum of 10 acres or more," said Mr Feinberg. "If I took you to this site on Staten Island [where he found the frogs], apart from the fact that you could see the Manhattan skyline in the distance, you wouldn't know you were in the city." Dr Gerardo Garcia, a specialist in conservation of rare amphibians and reptiles, based at the UK's Chester Zoo, described the discovery as "big news". "[This] comes thanks to the combination of new technologies and advances in techniques in genetic analysis," he said. "Elsewhere though, in places such as Madagascar, taxonomists and conservationists are racing against time to describe species before they become extinct. "There is a huge backlog of species to describe and find out about that we do already know of, but sadly we're late because the speed of extinction is faster than the capacity to protect them." Mr Feinberg said that the species' need for expansive wetland habitats in such a developed area could make it vulnerable. "This frog is entitled to live. and we're entitled to our houses, too," he said. "So I think we have to consider that this is a planet that we share." He added: "Imagine we moved forward 50 years and this frog had never been discovered. We might have destroyed its habitat and never known it was there. "But this gives me hope that the species could be protected."